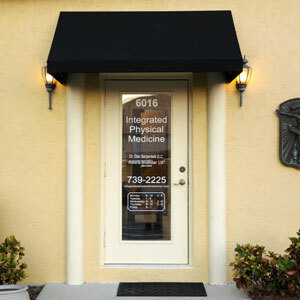 Integrated Physical Medicine offers you a relaxing atmosphere that puts you at ease from the moment you arrive. Our front desk team is friendly, welcoming and nurturing. A large-screen television on the wall displays calming nature scenes. We will explain everything to you before starting so that there are no surprises, and are always ready to answer your questions. You will sit down with Dr. Serpentelli to discuss your problems one-on-one. We will give you an extremely thorough evaluation to understand what is causing your issues. It is important to us that your pain relief starts immediately and we will offer you a form of soothing treatment. When you return, you will receive a detailed report of Dr. Serpentelli’s findings. He will go over your examination, health history and X-rays if taken. A specific, custom-tailored treatment plan will be recommended to you with numerous options you can select from. You can make the choice of what is best for you. Gentle techniques are used that include both hands-on and instrument-based adjustments. At each of your following appointments, we will discuss how you are progressing and any concerns that you might have. You will receive chiropractic care and any additional therapies as appropriate. We understand your time is valuable and make sure you move in and out of the office promptly and efficiently. Are you wondering what chiropractic care might do for you? Book your time with our supportive team today!